Travel back in time 150 years and retrace a portion of John Wesley Powell’s historic first descent of the Green River. Joining the full expedition to provide commentary and a compelling backstory to this once-in-a-lifetime river adventure is resident historian and geologist Dr. Michael P. Ghiglieri. One of OARS’ original guides, Ghiglieri has run more than 680 river trips on 40 different stretches of river and he’s written several books, including First Through Grand Canyon—an evocative read that pieces together the secret journals and letters of the 1869 crew who first explored the rivers of the Colorado Plateau alongside Powell. Your adventure begins just below the Flaming Gorge Dam where you’ll float the splashy, crystal clear waters of the Green River before entering Dinosaur National Monument and Gates of Lodore. Here, in one of North America’s most beautiful river canyons, you’ll spend several days running exciting whitewater, hiking to scenic overlooks and discovering an archaeological treasure chest where prehistoric fossils co-exist with ancient petroglyphs. 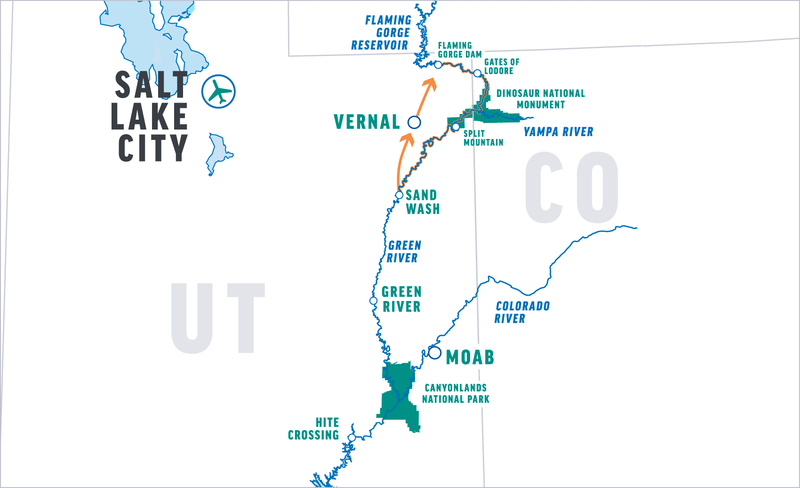 We begin our trip with a scenic drive from Vernal to our put-in below the Flaming Gorge Dam, where the boats and the rest of the OARS crew await. After a detailed safety talk, our journey begins. The first day is full of fun whitewater, including Anticipation Rapid, Roller Coaster Rapid and Mother-in-Law Rapid. The splashy, crystal clear waters of the Green River carry us into the heart of Ashley National Forest. Our first day sets the pace for the rest of our days on the river. Typically, we spend a few hours on the water in the morning, sometimes stopping for a great hike or a refreshing swim. At lunchtime we pull over to a sandy beach and enjoy a delicious picnic. After feasting and relaxing on the beach (or perhaps a game of Frisbee or horseshoes), we get back in our boats and watch the desert panoramas slowly develop in-between bursts of thrilling whitewater. Mid- to late-afternoon, we stop and make camp. You grab your bags and set up your tent while the guides take care of the kitchen and “living room”­—camp chairs and the site for tonight’s campfire (if permitted). This is the perfect time for you to lounge on the beach with that book you’ve wanted to finish. Before long, you’ll be savoring pleasing hors d’oeuvres and the beverage of your choice—delicious as these refreshments are, they always taste better after a day on the river! Nap, take an exploratory hike, or just sit back and laugh with friends and family as the guides prepare dinner. Your days begin with the morning light illuminating the canyon walls with a warm glow. Fresh coffee and tea are waiting for you when you get up; grab a cup, sit back and take in the glory of the awakening river. Soon breakfast is served, and once you’ve eaten your fill, you’ll pack up your things as the guides break down camp, then our new day’s adventure begins. Along our journey, we’ll see red rock canyon walls of the Uinta formation, that date back a billion years to some of the oldest sedimentary rock. After our last big rapid at Red Creek, the river flattens out as we descend into Brown’s Park, where swift currents carry us through Swallow Canyon and into the Browns Park National Wildlife Refuge. We’ll stop to spend time at the world-famous Jarvie Ranch, a BLM-restored historic site offering visitors a glimpse into turn-of-the-century pioneer life along this stretch of the Green River. During the evening, we will make camp on the riverside among lodgepole pines and junipers. If our guides don’t arrange a hike, you may want to enjoy a self-guided walk, or perhaps you’d rather just relax and wait for dinner—always a trip highlight, as the day’s adventures stir up a hearty appetite. After our meal the group dynamic of our trip is at its best as we gather around the campfire for nighttime conversation and laughter. Entering Dinosaur National Monument and Gates of Lodore, we start off with a bang as we challenge more exciting rapids: Winnie’s Rapid, Upper and Lower Disaster Falls. Here, Major Powell lost one of his boats and innumerable provisions during his 1869 journey—hence the rapids’ ominous name. Harp Falls, Triplet Falls, and Hell’s Half Mile are a few other rapids that provide big thrills. Several smaller waves and riffles keep us busy, yet there are enough calm sections to allow us time to sit back and soak in the remote splendor of Lodore, with its soaring red rock cliffs sprinkled with deep green junipers and pinyon pines. An exciting hike awaits us at Rippling Brook. Our path along this small creek leads through a spectacular side canyon to a pure, spring-fed waterfall — the perfect place for a cooling shower. We will pass the confluence with the Yampa River, as we wind around gigantic Steamboat Rock and into Echo Park. Here we may stop to visit some intriguing Fremont petroglyphs near the side of the river, or perhaps we will hike to Whispering Cave, passing magnificent sandstone formations along the way. Back on the river, we travel through some of the oldest exposed rock in the Southwest. As we descend further into the canyon, we have the rare opportunity of seeing various layers that comprise the surrounding cliffs, each layer representing a different stage of the earth’s development. Hundreds of millions of years of geological formation are displayed in the walls around us. Upon reaching Whirlpool Canyon, we might hike along beautiful Jones Hole Creek to amazingly well-preserved panels of prehistoric pictographs and petroglyphs. After a bit of flat water, we pick up speed and enter Split Mountain Canyon, where the river’s gradient becomes considerably steeper. Four major rapids deliver plenty of whitewater excitement before stopping for the evening. Here we enter the Uinta Basin, where the days begin on the calmer stretch of the Green River, as we head southwest we pass through the town of Jensen and a cultivated valley. We will use an outboard motor through much of this section as we have many river miles to cover. This is the perfect opportunity to sit back, relax, and take in the vast open sky and scenery. In the 1900’s this section of the river was dotted with gold dredges and placer claims. In more recent years, it has been a popular area for sizable petroleum reserves. Keep an eye out for sheltering animals and migratory birds, as the Ouray National Wildlife Refuge straddles the Green River. When we reach our take-out point at Sand Wash, we’ll say good-bye to our fellow travelers and take a shuttle ride back to Vernal, and return to the OARS Warehouse between 4:00 and 6:00 pm. Each day varies, but on an average you’ll spend 4-8 hours a day on the boats. The rest of the time will be spent hiking and exploring, eating, or just relaxing in camp. We generally plan at least one guided hike a day, depending on conditions. There is ample opportunity for the curious to explore the area at length. Please let your trip leader know if you are an avid hiker and remember to bring extra water bottles and good shoes. Remember, however, that all hikes are optional and you can choose to lie on the beach and take in a few tanning rays or read a book instead. Lastly, the Trip Leader must consider to overall ability of the group when deciding what hikes to offer. Bathing is allowed in the Green River, but must be done with biodegradable soap. It is not, however, allowed in any of the side streams that feed into the river. If you plan to bring soap, we recommend Campsuds or Dr. Bronner’s, which can be purchased in most stores that have a camping section. Disposable anti-bacterial towelettes (Coleman Swash Cloths, baby wipes, etc.) are good alternatives to submersion in the river and are especially convenient. The respective flow on the Green River is the story of human impacts on a very distinct watershed. The Green River’s headwaters lie in the Wind River Range of Wyoming, and its stream is repeatedly blocked and diverted, most sizably by the Flaming Gorge Reservoir, not far upstream from Dinosaur National Monument. Thus, its flow is determined by reservoir releases. The Green also will spike in the spring and early summer as the controlling agency at Flaming Gorge Dam releases water to make room for inflow. Peak releases from Flaming Gorge on the Green usually occur between mid-May and mid-June, but can vary widely from early May and into July. High water trips equate to a more intense whitewater experience and a high level of physical fitness is recommended. Water temperatures are coldest during the high water period and rain gear and warm synthetic clothing will be required. In reality the water is quite cold even in the summer, but lower flows and warmer air temperatures mitigate the risk of hypothermia. We supply a professionally laundered sleeping bag with sheet liner, a pillow with a freshly laundered pillowcase, a sleeping pad, a ground tarp as well as a shared tent. The complete customized sleep kit that we provide is designed for your comfort and maximizes available luggage space. Our sleeping bags are degree rated depending on the season and are 33” x 84,” which is longer than the normal (80”). We recommend you take on the river only what’s absolutely necessary. Keeping gear to a minimum insures it will fit into the waterproof bags we supply and reduces unnecessary packing and unpacking in camp. If you do have extra luggage you will need to store it in your vehicle, or you may check with the trip leader about storing small items in the OARS office. We recommend that you leave your valuables at home. For personal items like wallets, purses and cell phones, we recommend putting them in a zip-lock bag at the bottom of your waterproof bag with your clothing. You may also check with the trip leader about storing them in the OARS office. Everyone is required to sign a standard liability release form before the trip, acknowledging awareness that there are inherent risks associated with the trip. Due to the nature of the activities, a condition of your participation is that you will sign this form and return it to our office before the trip begins. Anyone who refuses to sign the form will not be allowed to participate, and consistent with Hatch cancellation policy, there will be no refund of the trip fees at that time. O.A.R.S. Canyonlands, Inc and cooperating agencies act only in the capacity of agent for the participants in all matters relating to transportation and/or all other related travel services, and assume no responsibility however caused for injury, loss or damage to person or property in connection with any service, including but not limited to that resulting directly or indirectly from acts of God, detention, annoyance, delays and expenses arising from quarantine, strikes, theft, pilferage, force majeure, failure of any means of conveyance to arrive or depart as scheduled, civil disturbances, government restrictions or regulations, and discrepancies or change in transit over which it has no control. Reasonable changes in itinerary may be made where deemed advisable for the comfort and well being of the participants, including cancellation due to water fluctuation, insufficient bookings (this trip requires a minimum of 4 guests), and other factors. There is risk in whitewater rafting, particularly during high-water conditions. Rafts, dories and kayaks do capsize. You could be swept overboard. Your guide will make every attempt to assist, but you must be strong and agile enough to “self-help” and “float-it-out” without further endangering yourself or others. We reserve the right not to accept passengers weighing more than 260 pounds or with a waist/chest size exceeding 56 inches. We may decide, at any time, to exclude any person or group for any reason we feel is related to the safety of our trips. We are experienced at accommodating people with various disabilities. Please give us an opportunity to make you feel welcome. We need to discuss any special requirements ahead of time. On advancement of deposit the depositor agrees to be bound by the above recited terms and conditions. Prices subject to change without notice.